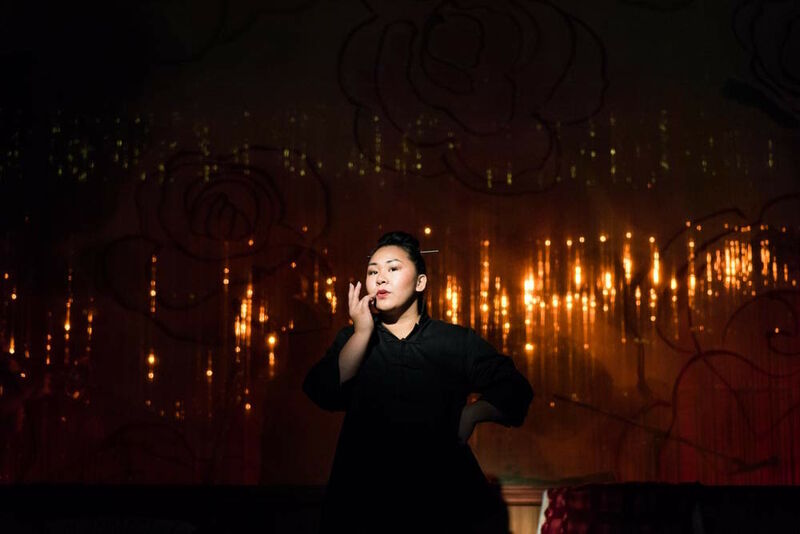 In her musical one-actor show, Sara Porkalob channels multiple generations of family history with charisma and brute force. Sara Porkalob appears as her mother and grandmother in Dragon Lady. "Trouble is a family trait," sings Sara Porkalob late in Dragon Lady, channeling her grandmother. Or was that when she stepped into the role of her own mother? Or aunt? No it was her grandmother, but as a young woman. There are, by my count, around a dozen speaking characters in Intiman Theatre's new production, and Porkalob plays all of them, often in heated arguments with one another. You wouldn't be remiss for losing track of who's who. The end result of this solo show—written by Porkalob and directed by Andrew Russell—could have been a catastrophe, the sort of misguided and overly ambitious trope seen in TV and movies as a way to poke fun at thespian types. But Porkalob holds it together rather nimbly, due entirely to her hilarious and unrelenting performance, and the frankness with which she tells the real life story of her Dragon Lady. That Dragon Lady is Porkalob's Filipino grandmother, Maria, who on her 60th birthday brought her granddaughter down to the basement to reveal a secret: Back home in the Philippines, grandma had been a gangster. We see this scene early on. The two-tier set at Jones Playhouse is that basement, complete with beige shag carpeting and worn velvety reclining chair. But it also acts as a Filipino nightclub, a trailer park, the hospital bed on which Sara herself came into the world, a suburban street, a crime scene. 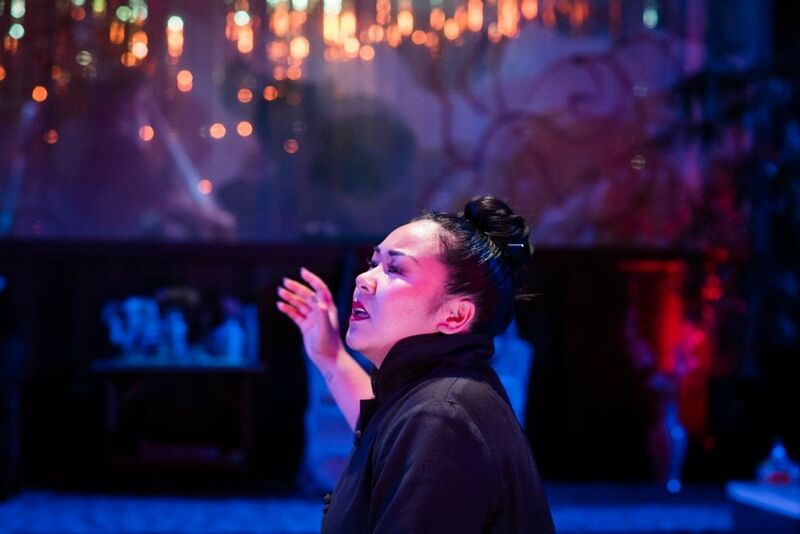 Cued by lighting changes, Porkalob leaps in and out of memory, telling a nonlinear story of how young club singer in the Philipines became a single mother of three living outside of Seattle. It's a story that involves more than a few disturbing details about child trafficking, gang violence, and exploitation. But Porkalob does not shy away from these moments. Even after Maria's inevitable escape to the comparatively safe confines of the Seattle suburbs, the play pauses for a lengthy illustration of how, exactly, the struggles of a parent get passed down to the children. As dark as these moments play out, the play at large bursts with life, laughter and music. Porkalob jumps around characters without batting an eye, but she feels most vibrant and dialed-in as Maria. Here, she leans into the Dragon Lady stereotype—20th century pop culture's depiction of powerful, deceptive, sexually charged Asian woman—and has fun with it. Maria as a youth becomes a fearless killer. As a mother she passes this onto her children, demanding a 5-year-old child beat another child to death with a golf club. This latter scene shoots for laughs, and gets them, but it's clear this came from a real family story. In another scene, Maria raps "Gangsta's Paradise" by Coolio and kills it. The music of Dragon Lady might be the standout. Mainly because Porkalob has some pipes. She belts her way through musical numbers that snap back and forth from vulnerable to sultry to all-powerful, backed up by a piano, upright bass, and trombone trio (Pete Irving, Mickey Stylin, and Classic Jimmy) that shouldn't work but ends up adding a touch of surreal bayou magic to the proceedings. As with much of the play, you just have to go along with it. Dragon Lady is not for everyone. Porkalob challenges the audience to keep up as she leaps from memory to fantasy and between characters. More than a few times these characters muddle together both in time and in the performance. These are the stretches where Porkalob might have done some cutting to focus on her immediate family, the people most vital to the story. And I did find myself asking if a one-actor show, even one so committed and largely successful, was the best medium to tell her grandmother's harrowing story. It may not be the most coherent way to tell Maria's story. But this is also Sara's story. Possessed by the ghosts of family history and the women who helped raise her, Porkalob shows how she takes these experiences inside of her, how she came to be her own Dragon Lady. And when the story comes full circle in an unsurprising but no-less moving reveal, you'll be glad she kept it all in the family.